This Project combines mouse mutagenesis, viral-mediated gene transfer, and cellular electrophysiological recording techniques to examine changes in synaptic and membrane properties of ventral tegmental area (VTA) dopamine neurons and their targets—medium spiny neurons (MSNs) in the nucleus accumbens (NAc)—elicited by drugs of abuse. We are striving to identify subtypes of neurons in both brain regions that show differential responses to drug and natural rewards as well as to aversive stimuli. In addition, we are interested in the role played by expression of transcription factors that have been shown, by the other Projects of this Program Project Grant, to exert significant effects on the rewarding properties of drugs of abuse. One example is CREB, which we have shown reduces an animal's sensitivity to drugs of abuse via activation of NAc medium spiny neurons. 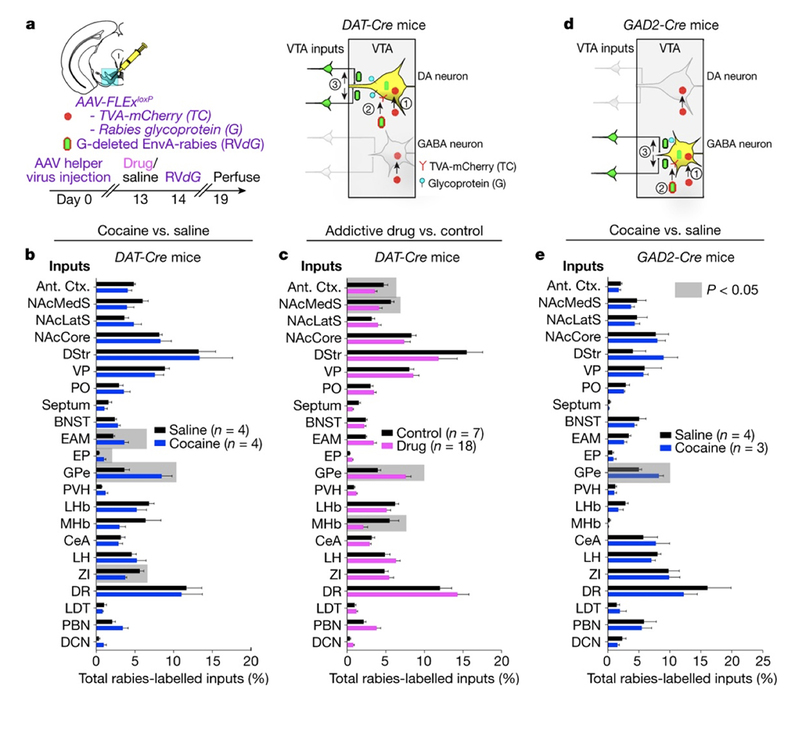 (Right) Figure shows novel strategy used for labeling inputs to VTA dopamine neurons. From Beier et al., Nature, 2017.